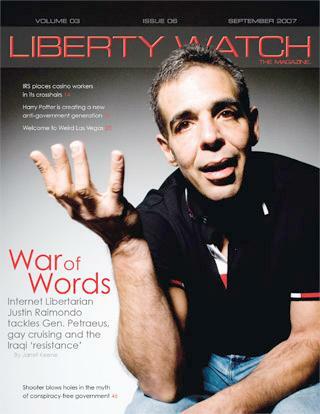 Justin Raimondo: On Warmongering Neocons & Being Wrong on Rand Paul. The Two Wings of the Republican Party. Below is an excerpt from Uber-Libertarian Justin Raimondo. The whole article at his website is worth a read. “Although Graham predicted Republican support for more aggressive U.S. involvement in the world, he acknowledged that some new members of Congress, particularly those elected under the tea party banner, are likely to have different foreign policy views. “AMANPOUR: Pay for soldiers? Would you cut that? “PAUL: Right. I think that soldiers have to be paid. Now, can we say that gradually we don’t need as large of an Army if we’re not in two wars? Yes, I think you can say that. You can save money there. You can bring some troops home or have Europe pay more for their defense and Japan pay more and Korea pay more for their defense or bring those troops home and have savings there. “AMANPOUR: Have you thought much about foreign policy? Does the Tea Party have a foreign policy? Shame on Amanpour for throwing him that curveball, and kudos to Rand Paul, whom I seem to have seriously misjudged. I guess that meeting with Bill Kristol and the neocons didn’t mean what I feared it meant. His remarks not only validate his anti-interventionist credentials, but they also show what a good politician he is becoming: in these war-weary days, you can’t say “bring the troops home” often enough. I’m glad to admit I was wrong about Rand Paul because I can breathe a lot easier, now, knowing he’s going to be a credit to the libertarian movement and his father’s legacy. Oh, to be sure, I don’t agree with his opposition to the renewal of the START treaty: does he really think we need to spend billions on nuclear rearmament and re-start the cold war? Is there really a possibility of a Russian nuclear attack on the United States – which is what our nuclear posture is geared up for? To ask the question is to answer it in the negative, to be sure. But then again, as I said, Rand Paul the politician is coming into his own: he owes a lot of chits to Jim DeMint, who is making opposition to START his signature issue in the Senate, and it wouldn’t do to cross him, just yet. Very crafty, or too crafty by half: we report, you decide. While we’re on the subject of Rand Paul: I predict it won’t be long before we start hearing about his presidential prospects. After all, I seem to recall another freshly-elected US Senator who made it to the White House without serving out his term. Rand is young, he’s very presentable, and, although he does a good job of hiding it, he’s just as radical as his father. Why, he even had me fooled. Radicalism may seem like an undesirable trait in a potential candidate for the White House – and that would be true if we weren’t in the midst of America’s Second Great Depression, and we weren’t fighting two wars at once. That’s why the movement founded by Rand’s father has picked up so much support lately: the Campaign for Liberty is now a major factor in GOP politics – while Rudy “One Delegate” Giuliani, who unsuccessfully tried to marginalize Ron Paul, is yesterday’s news. That’s also why Ron may run again in the GOP presidential primaries: if he does, you can be sure the foreign policy issue will be front and center…. ← The Republicans Won in 2010; Will US convert from a full headlong rush into socialism, to a full body tackle of corporate fascism?